On Saturday, 22 September 2018, the Worthing Citadel Band (Bandmaster Alan Slator), Worthing Citadel Songsters (Songster Leader Wendy McDaniel), and the Community Spirit Choir presented a “Last Night of the Proms Concert” in aid of “The Big Collection”. Special guest for the evening was Ira Thomas, Regional Music Specialist for the West Malling Region. In the first half of the evening, the band presented Toreadors March from Bizet’s “Carmen” and Shine. The songsters offered Wade in the Water and the community choir sang a variety of light-hearted songs. Special guest Ira Thomas thrilled the audience with her vocals and piano skills. The second half began with the band playing Sounds of Britain. The songsters sang You Raise Me Up and The Lord Is My Strength. The audience also participated, with Ira Thomas leading them in several songs from the shows. Thomas and the band led a “Last Night of the Proms” finale. The audience joined in with great enthusiasm, singing Rule Britannia, Land of Hope and Glory, and Jerusalem. 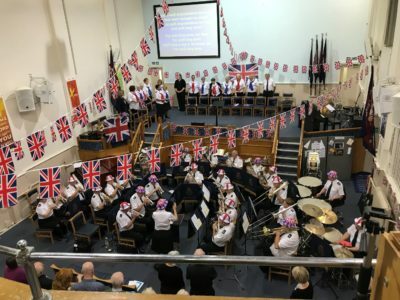 This article was posted in News and tagged Alan Slator, benefit, Community Spirit Choir, concert, Ira Thomas, Wendy McDaniel, Worthing Citadel, Worthing Citadel Band, Worthing Citadel Songsters on 29 September 2018 .